Mid-Day Munch: Packing a Healthy Lunch Your Kiddo Won’t Want to Trade! 1. Make it look good – Kids are enticed (or repulsed) by the way a food appears. 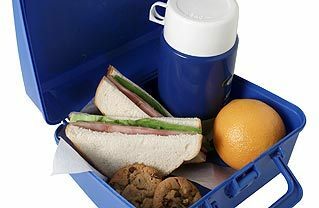 Have your child pick out a lunchbox, thermos, and water bottle of their choosing to bring to school. Pack fun and colorful stickers or notes for your child. Take it a step further and use cookie cutters to make sandwiches into unique shapes. If it looks interesting and appealing, they are more likely to eat it. It may take a little extra time in the morning, but if your child eats the food, then it’s worth it, because it prevents your precious grocery money from going to waste. 2. Bump up the fruits and veggies – Instead of the standard sides of potato chips or cookies, which can lead to an energy crash by mid afternoon, try cutting up fruits and/or veggies and packing them along with a tasty dip. Examples include apple slices with natural peanut butter, baby carrots with hummus, or strips of bell pepper or broccoli florets with ranch dressing. These options tend to be easier and more fun to eat, and the fact that they’re dunkable makes them a guaranteed hit with kids! 3, Think outside the bread – Lunch doesn’t have to be the same old sandwich. Get creative with it! How about leftovers from last night’s dinner, homemade soup kept warm in a thermos, or an easy pasta salad? If all else fails, at least switch up the type of bread you use – try whole wheat tortillas, pitas, bagels, or English muffins for a new twist on a lunch time staple. Trust me, your child will appreciate the change! 4. Don’t downplay the drink – Many children’s drinks are nothing more than a source of sugar and calories. Substitute low sugar juices or flavored waters so your child doesn’t get bored with plain water. You can even pack a stainless steel thermos that will keep milk cold all morning! 5. Plan, plan, plan – Have an arsenal of kid-friendly recipes at your disposal. If you’re not sure where to start, the internet is your best friend as there are an endless number of resources. When grocery shopping for the week, include items that you intend to pack and attempt to incorporate dinner leftovers. Prepare lunches the night before to avoid the morning rush, and keep frequently used foods and condiments handy. Try portioning foods like produce, cheese, and crackers in tupperware or baggies for easy grab-n-go! Don’t think of packing your child’s lunch as a chore – make it fun! And know that packing your child healthy, balanced, and interesting meals is teaching them the importance of nutrition and eating right. To learn more about healthy eating for kids, head on over to the ADA website at www.eatright.org. Is one of your little ones a picky eater? Let us help! Go to our homepage and click “Contact” to get in touch! Or you can tweet us anytime @FamilyFoodLLC!